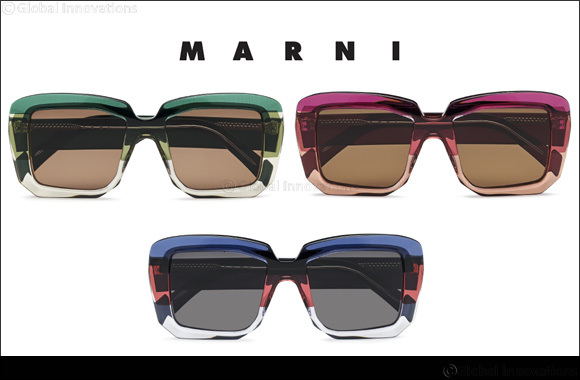 December 16, 2018: Marni's avant-garde spirit is perfectly expressed by Marni Rothko, featuring rectangular frames that play with geometric silhouettes and bold volumes. Part of the new Fall/Winter 2018 collection, the new Marni Rothko sunglasses feature a 7-layer acetate structure further enriched by a multiple milling process which is applied to the frame-front to emphasize the unique geometric design. The frame has a faceted profile that creates a chromatic play of light, while the thick, transparent temples reveal the unexpected internal core wire detail. The color palette includes four gorgeous custom-made acetate shades including Grey, Blue, Sage and Wine.